The two key levers any company can pull when it comes to Knowledgebase ROI are Consumption and Satisfaction. This report provides quick insight into how every interface (business unit) is trending with respect to the Consumption side of the equation. 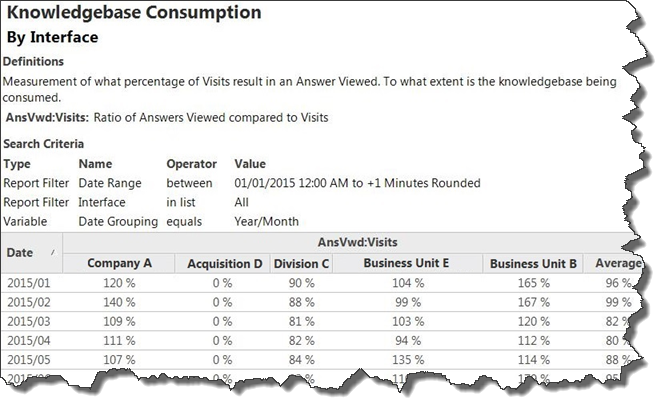 Overall description/purpose: Understanding the current and historical consumption levels of each business unit (interface) inside of a company provides insight as to where focus needs to be placed in either increasing or decreasing Consumption. For Agent-facing interfaces, a Consumption rate between 200% and 400% is completely understandable. On the other hand, if the average end customer is needing to view 3 to 4 Answer (300%-400%) per Visit (4-hour window), then there may be opportunities in how Search is working and how the Customer Portal is laid out. For end customer interfaces, anywhere in the range of 125%-140% is best practice, depending on the specific use case. For an interface to be at zero (Column 3, “Acquisition D”), it’s evident that knowledgebase is not being used at all. Use case being served: Let’s make some assumptions about “Division C”. They had a knowledgebase that was performing fantastically in 2014 as evidenced by a Helpful% (Satisfaction) rating of 74%. (Average is 43%) Over the course of the four years preceding 2014 (2010-2013), they had grown their Knowledge Satisfaction rating from 40% up to 74%. However, their Consumption was lagging at 68% in 2014. They’re B2C and they knew that 68% was subpar. Compared to their 1.2m live agent contacts a year, they were only getting 2.4m Answers Viewed a year – a 2:1 ratio of Answers Viewed to Contacts. They wanted that ratio to be 5:1 by 2015 and 10:1 by 2017. With their Knowledge Satisfaction in the upper quartile at 74%, better content wasn’t a big part of the solution of getting to 10:1 by 2017. Getting more eyeballs on the content and driving Consumption was the key. Quarter by quarter, from 2014 to 2016, they made incremental changes to their website to drive up Consumption. Some of the methods they used were: re-design the layout of the Customer Portal landing page, introduce visual objects instead of text on the landing page, present knowledge widgets on the corporate website MyAccount page and on the product checkout page, and the implementation of engagement engine to use in delivering knowledge widgets elsewhere on the corporate site. Quarter by quarter and month by month, they were able to see their knowledge consumption rate steadily rise from 68% in 2014 to 120% in 2016. 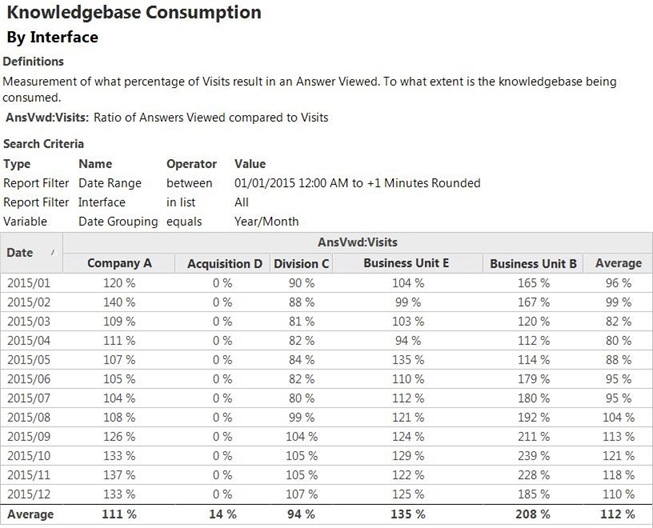 120% Consumption with 74% Satisfaction – that put them squarely in the Knoweldgebase Performance Magic Quadrant. High level flow for report creation: The only requirement to use this report is to import it. Once in Reports Explorer, click on New Report, and then Import Report definition. We are leaving these report recipe posts open for comments, because we want report chefs to hear how their report recipes helped you. 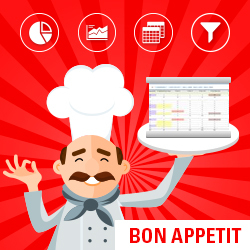 If you found this report recipe helpful, please give Joe's post a thumbs up and leave a comment letting him know you appreciate his help, how this report helped you and your organization, etc. If you have a question about this report recipe, please start a new topic in the "Reporting and Analysis" forum board and link to this report recipe in your question. * What is the definition of "Visit"? When does a visit start/stop? Is it possible users have multiple "visits" during a shift? * If consumption is over 100%, for example 400% consumption - assuming this means users view an average of 4 Answers during each visit?